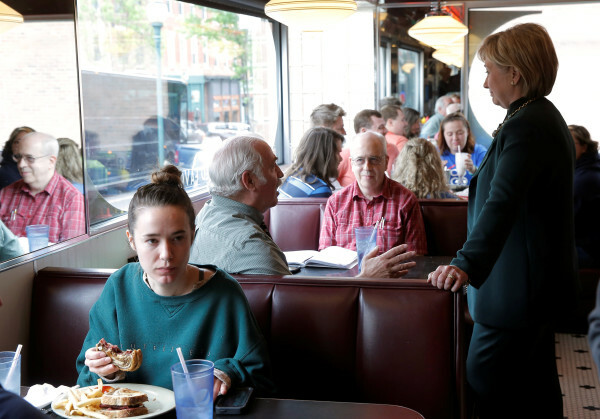 Hillary Clinton speaks to customers at the Court Street Diner during a campaign stop in Athens, West Virginia, in May. West Virginia has five electoral votes. If a new poll turns out to be a good prediction — it shows Donald Trump leading Hillary Clinton by only 6 percentage points in Texas — I’m going to get to vote in a competitive state this November. Thrilling! Of course, it will be only my second time in nine presidential elections. Like most states, Texas typically isn’t competitive at the presidential level. Strike one against the Electoral College is that it turns voters in such states into bystanders. That’s why some want to abandon the Electoral College and let the popular vote totals determine election outcomes. I get it. In my first presidential election, Ronald Reagan took Arizona, where I voted, by 34 percentage points. That’s the biggest blowout I’ve voted in, but other states where I’ve voted for president — Arizona twice, California twice, Texas three times — have had margins of 21, 13, 13, 21, 23 and 16 percentage points. The exception to these landslides was when I lived in Indiana in 2008. Barack Obama prevailed by a single percentage point — just under 20,000 votes. Strike two against the Electoral College is that the only way a state such as Indiana or Texas gets close is if the national election is a blowout. Texas will only be contested if Clinton maintains a national lead of close to 10 percentage points, which means she’ll win far more than the necessary 270 electoral votes regardless of what happens in the Alamo State. So if we want every voter to cast a meaningful vote, we should get rid of the Electoral College, right? Well … it’s more complicated than that. In Indiana in 2008, we were treated to a hard-fought campaign. But even though the contest was a nail-biter, I couldn’t pretend that my vote actually made a difference. Even in the 2000 election in Florida, where George W. Bush’s official margin of victory was only 537 votes, no single vote, which would’ve cut Bush’s margin to 536 or increased it to 538, mattered to the result. A national vote for a single office in a nation of some 325 million people just can’t be set up in such a way that one vote makes a difference. That would still be true if the Electoral College were reformed or eliminated. Many elections do come down to one, or at least a handful, of votes. But that happens almost exclusively in local elections with small constituencies. The point isn’t that people shouldn’t vote — I vote in every election, no matter how big or small. The point is that you shouldn’t mistake voting for democracy; it’s simply one of many avenues of democratic engagement. As I’ve said before, voting is democracy with training wheels. If you really want to influence election and policy outcomes, you need to do more, generally by getting involved in a party or interest group. The resources that campaigns find valuable — money, expertise, phone calls, labor — are generally portable across state lines. So even if Texas isn’t competitive, we Texans can still contribute elsewhere. U.S. political parties are open source — anyone can walk in off the street and get involved, and if they stick around they can eventually influence the priorities or even the policy preferences of a party. Interest groups are less open to change (the National Rifle Association isn’t going to support gun control, and NARAL won’t oppose abortion rights, no matter how many new members join), but the larger an interest group becomes, the more influence it can have. Best of all, local elections are the easiest of all to influence. That the Electoral College gives the smallest states disproportionate strength is a legitimate criticism. But it’s a less weighty issue once you recognize that you can exert political influence beyond voting. Because with or without the Electoral College, your individual vote is unlikely ever to be decisive.